Getting your learner's permit is such an exciting thing and that's why we want your path to get there to be just as enjoyable. The state of Florida requires all new drivers to complete a certain amount of classroom training before being eligible to get their permit, but we know that you spend all week in classes at school and that's why we've created an alternative for you. We have designed a Florida First Time Drivers Ed course that is entirely online, so you can access it from any computer with an internet connection. This Florida Drivers Ed course is even approved by the Department of Highway Safety and Motor Vehicles, so it satisfies all of the same requirements as a classroom-based course, but without all of the hassle. 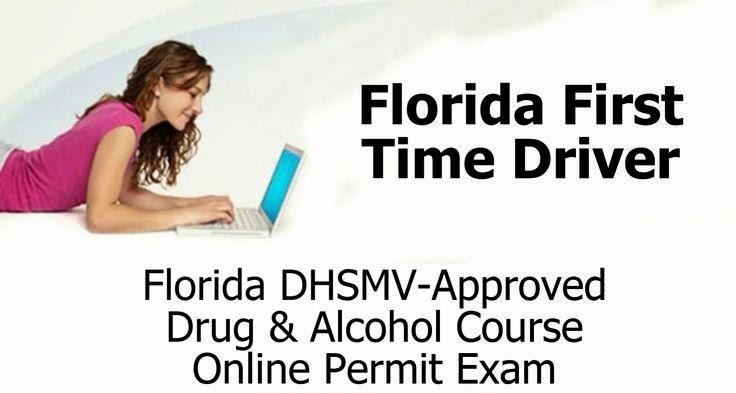 Online Drug and Alcohol test for Florida Learner's permit: Everything you need to help you ACE your Florida DMV exam and get your license including the TLSAE course. Florida, our 4-hour, 100% online Traffic Law and Substance Abuse Education (TLSAE) course is approved by the state of Florida. This course must be completed before taking your DMV permit exam. Complete the Permit Exam online after you have completed the required TLSAE course. This exam consists of The Road Rules and The Road Signs test. In order to qualify for the online DHSMV exam, you must have completed the TLSAE from us. Complete both the course and exam ONLINE for one low price in order to meet the requirements to obtain your Florida Drivers Permit. No waiting in line at the DHSMV, no making appointments. Convenience and affordability all in one! This Florida driver education course consists of eight units and each one covers a different driver-related issue. You can log in and out of this course as many times as you like, so you can complete it in multiple sessions and at a pace that is comfortable for you. There are short quizzes at the end of each unit to help you review what you have just learned and you can take them as many times as you need. When you have finished the course in its entirety then you are eligible to take your Florida permit test online. This means that you can get your learner's permit without ever having to step foot in the DMV, or wait in any lines. Log on right now and you can get started on your future today. Florida First Time Driver Education Course. Simple. Easy. Convenient. Hassle Free. It's EXACTLY what you've been looking for. So, go ahead, start down the road to getting your Florida Learners Permit or license by signing up today!